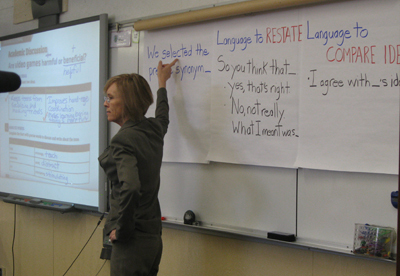 Kate Kinsella offers insights and strategies to support English learners in becoming focused and proactive listeners during classroom discussions. As U.S. K-12 classrooms move to incorporate 21st Century skills to prepare students for increasingly complex learning, life and work environments, a strong emphasis has been placed on effective communication and collaboration with other individuals to accomplish a common goal. From kindergarten to AP coursework, young scholars are now routinely expected to demonstrate their ability to work productively with diverse lesson partners and teams. While teachers across subject areas assign advanced literacy and problem-solving tasks, many aspiring collaborators are under-equipped with the requisite language and listening skills. Students grappling with core content in a language they are striving to master approach lesson interactions with the most compelling auditory processing and linguistic needs. An area of acute instructional neglect within K-12 college and career readiness initiatives is attentive listening. Neophyte collaborators may be admonished to “listen carefully,” yet rarely are the discrete skills of engaged academic listening formally introduced, practiced, and monitored in a thoughtful scope and sequence. There is an assumption that listening processes and behaviors will naturally improve through mere exposure to the target language. However, there is clear consensus in the second language listening research arena that the focus of instruction must shift from whether listening comprehension is simply achieved to how it is achieved, with greater attention devoted to building students’ coping mechanisms for new contexts and tasks. To survive during the rapid-fire exchanges of unified class discussions and small group tasks, second language listeners need a productive toolkit of strategies and skills to appropriately exert some damage control when they experience inevitable lapses in comprehension or retention. To capably interact with a partner or group, a student must be able to follow the flow of ideas, digest the information, participate equitably, and build upon other’s contributions. This is a lot to juggle for a native English speaker, let alone an immigrant youth with gaps in English language knowledge and weak conceptual foundations for the lesson content. English learners, like all second language learners, benefit immensely from explicit verbal strategy training to gain the tools they need to meet their classroom interaction listening challenges. In terms of student-to-student interactions, English learners must learn an immediate set of expressions to productively intervene when they either know or suspect their listening is flawed. High-priority language functions for responsible listening within lesson teamwork include the following: restating ideas; paraphrasing ideas; clarifying ideas; agreeing; and comparing ideas. Knowing a few key phrases to voice agreement and point out similarities in perspectives helps novice English speakers, demonstrate engagement and compatibility in thinking, rather than being perceived as a passive, taciturn, and less than vital group appendage. Agility with expressions to restate, paraphrase and ask clarifying questions enables less proficient listeners to verify the accuracy of their processing, and in so doing, adeptly procure additional, and often more conscientious, explanation. This is a vital life skill they must take to a myriad of contexts within and outside school confines, from interactions at the Boys and Girls Club to sports teams to church meetings and jobs. This article originally appeared in Language Magazine - the journal of communication and education. Click here for more articles on language and college-and-career readiness. Kate Kinsella, Ed.D. is an adjunct faculty member in San Francisco State University’s Center for Teacher Efficacy. She provides consultancy and training for state departments of education throughout the U.S., school districts and publishers on evidence-based instructional principles and practices to accelerate academic English acquisition for language minority youths. A “teacher’s teacher,” Dr. Kinsella hones her pedagogy by adopting classes, co-teaching lessons, and coaching fellow teachers and administrators. Her numerous publications and programs focus on career and college readiness for English learners and under-resourced students, with an emphasis on supported academic interaction, high-yield vocabulary development, informational text reading, and constructed written response.